One of the most challenging problems in modern statistics and machine learning is to find efficient methods for treating complex high-dimensional data. Classical parametric and nonparametric methods face the so called curse of dimensionality problem: high dimensional models are too complex to be estimated with a reasonable precision from small or moderate samples. One possible way out of this problem is based on one or another structural assumption which allows to reduce the complexity/dimensionality of the model. A number of such structural assumptions is popular in the statistical literature including single- and multiple-index, additive, models, projection pursuit and sparse models, among many others. 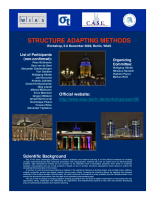 Knowing the structure allows for applying the classical methods to the reduced models. Unfortunately, the exact structural information is rarely available and the related problem is to extract the structural information from the data as an important preprocessing step. The aim of this workshop is bringing together leading specialists from the field of adaptive estimation for discussing the new approaches, ideas, challenges and addressing the algorithmic and mathematical aspects of this new and actively developing area of mathematical statistics and machine learning.